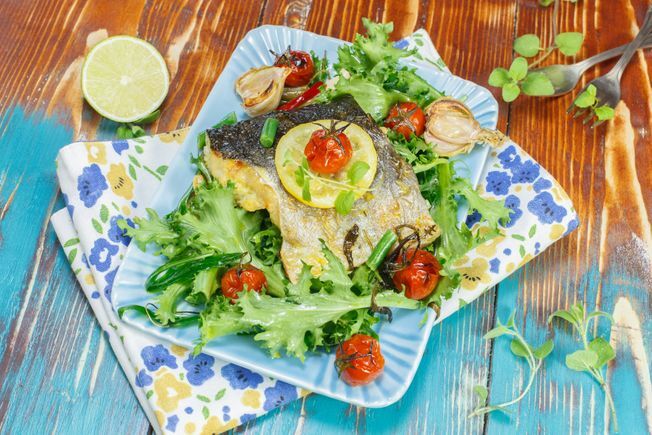 Here are some delicious, heart healthy fish recipes, quick and easy to cook, perfect for weekday dinners. Spread the potatoes and onion in a large roasting tin. Drizzle with 1 tablespoon of oil, season then toss to coat. Cook in the preheated oven for 15 minutes. Add in the tomatoes and cook for another 10 minutes. Reduce heat to Gas Mark 4, 180°C. Season the hake and add them to the roasting tin. Grate the rind off the lemon and reserve for dressing. Cut lemon into slices and place a slice on each hake fillet. Sprinkle the chilli over the fish and return to the oven for 10-12 minutes until the fish flakes easily with a fork. To make the herb dressing, mix the garlic, lemon rind and juice, parsley and 2 table spoons of olive oil in a food processor. Taste and adjust seasoning if needed. Place the mussels in a large bowl of cold water and clean. Remove any barnacles with a knife and pull away the beard. Discard any mussels that won’t close when tapped. Place the wine in a large saucepan over a high heat. Add the mussels and cover tightly with a lid. Allow the mussels to cook for 3-4 minutes. Discard any mussels that have not opened. Remove the mussels from the liquid and cool. Keep the liquid to include in the sauce. When the mussels are cool, remove the mussel meat from the shells and set aside. To make the sauce: Heat a tablespoon of oil in a saucepan over a low heat. Add the shallots and garlic and sauté gently for about 5 minutes until translucent. Add the mussels, red pepper, lemon juice and cooking liquid and gently warm. Taste and season accordingly. To cook the salmon: Heat some oil in a frying pan. Add the salmon into the pan and cook for 2 minutes, turn the heat down to medium, turn and cook the salmon for 2 minutes on the other side. At the last minute add the spinach to the sauce for a minute or two to allow the spinach to wilt. 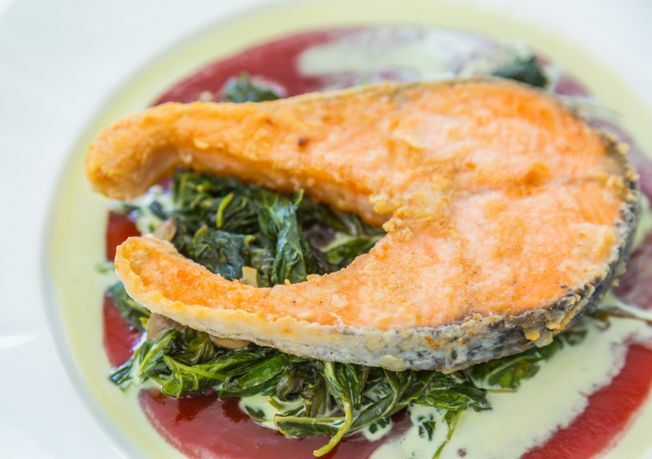 Serve the salmon with the mussel sauce spooned over. Peel potatoes and cut into chunky chips. Bring a saucepan of water to boil and add the chips. Boil for 5 minutes and strain. Transfer to a baking sheet. Drizzle chips with some vegetable or rapeseed oil ensuring they are all coated, then add a teaspoon of paprika, sea salt and pepper to taste. Add chips to baking sheet and cook for 40 minutes turning occasionally. Beat an egg. 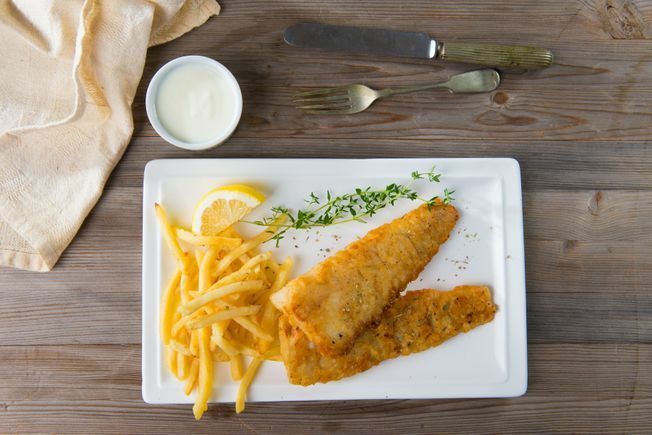 Dredge the cod fillets in seasoned flour, shake off any excess. Dip cod fillets into the egg mix then transfer to panko breadcrumbs making sure to fully coat the fish in the mixture. Heat oil in a pan over a medium high heat and add the coated cod fillets and cook for 3 minutes, lower your heat and turn your fish, cook for another 4 minutes until your cod develops a golden brown crust. Serve with peas and a wedge of lemon.